If you love to shop, then Krakow offers the visitor a wealth of opportunities. From small shops on the Rynek to large shopping centres, here called "galerias." The most essential of these are Galeria Kazimierz, Galeria Krakowska and the newly opened Bonarka City Centre. 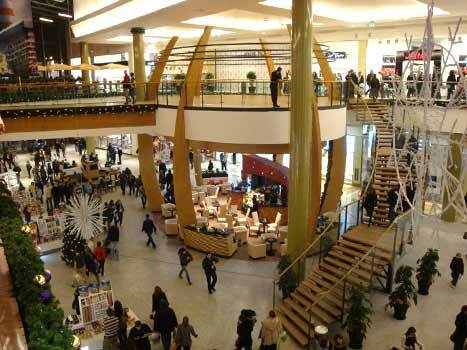 Above: One of the largest shopping centres in Central Europe, Bonarka City Centre is an experience. Let the uniquely lighted, candy-cane painted smokestack guide you to shopping nirvana. Opened in November 2009, Bonarka City Centre is a colourful splash on the shopping scene. Besides being brand new, it's one of the largest in Central Europe at 234 thousand square metres. Inside, the decor takes on a modernist feel, with lots of tall glass windows and bright wooden arches. The space appears simply massive. Good thing, too, because Bonarka is home to 270 stores, including more than 30 restaurants and cafes. One of our favorite spots to grab a coffee is on the simulated pond-and-fountain feature in the middle of the mall. Parking spaces are plenty and free. The only downside is Bonarka is is not directly on a tram line and the nearest bus spots are a small walk from the main entrances. But once you do arrive, you're in for a shopping experience. Hours: 10:00 - 21:00, though some stores open a bit earlier or stay open later. Trams: Nearest are at Rondo Matecznego (8, 10, 11, 23, 40). The galeria is visible from the Rondo. Just walk up the hill to reach the car entrance and take the walkways to the building entrance. Shoppers looking for it all come to Krakowska in droves. Whether visiting or living in Cracow, everyone seems to make their way here at some point. It helps it's the starting point for many who arrive at the main railway station, or from the airport by the express train. Packed with shops and restaurants, Galeria Krakowska has been going strong since 2006. It's also a convenient place to meet as it's a 10-minute walk from the Rynek and on all the main tram and bus lines through the centre of the city. Trams: 2,3,4,5,6,12,13,14,15,19,24 (ground level) and 50 (Dworzec Glowny "tunnel" at Level -2). It may be the smaller of the three we list here, but it is an altogether different experience. For one thing, we find it curiously peaceful for a shopping mall. The lack of obnoxiously loud teen pop and a reasonable layout make it a pleasant place to shop. A bonus in summer is after you've made your last purchases, you're just a short walk from the Vistula or some great Kazimierz cafes. Galeria Kazimierz is comfortably air-conditioned, and when you want to take a break just head to one of the nice restaurants or the centre's state-of-the-art cinema. Any advice on where i could buy good whisky or vodka in Krakow? Thanks. Helpful for my next trip.